Sharkoon reissues two of their upgraded PC towers: The Sharkoon Nightfall and the Sharkoon Rebel9 Aluminium are now available with a front USB3.0. Sharkoon has replaced the existing eSATA port on both Midi ATX towers with a SuperSpeed USB interface. For the internal USB3.0 port, a 19-pin connector cable is available for mainboards with a USB3.0 header. Both towers present themselves with an elegant, black-finished aluminium front, including a high-quality "diamond cut" edging and detachable drive covers. The SECC case on both models, with its exterior and interior black finish, are identical; differences consist in the front design and with the drive installation options. The Sharkoon Rebel9 Aluminium accommodates up to nine optical drives behind its integrated front. 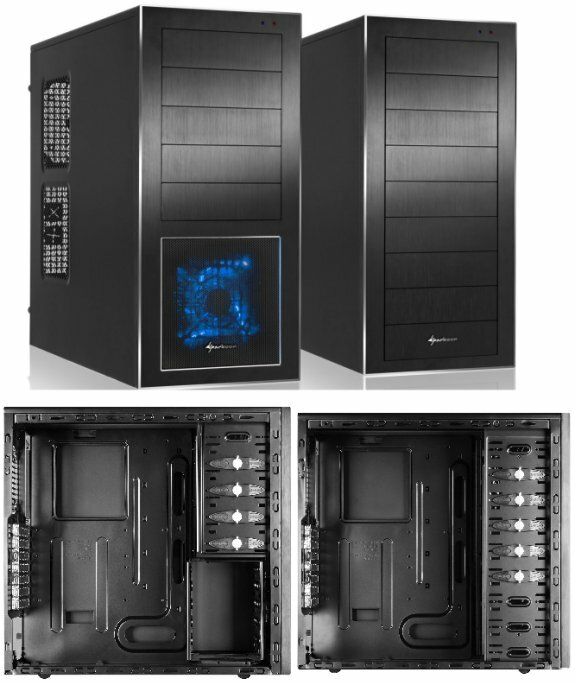 The Sharkoon Nightfall offers room for five optical drives and five 3.5 inch hard drives. The removable hard drive cage of the Sharkoon Nightfall is cooled by a blue illuminating 120 mm LED fan, which sits behind a mesh air intake in the front panel. In addition to the pre-installed front fan in both models, two 120 mm fans can be mounted on the side panel plus an 80 or 120 mm fan in the backside and a 120 or 140 mm fan in the tower?s lid. The functional range also includes the cable management and CPU cooler mount opening on the mainboard bracket, quick-locking mechanisms to mount the hard drives, base positioning for the power supply and feedthroughs for water cooler tubes. The easily accessible Top I/O with the new USB3.0 interface is complete with two USB2.0 ports, headphone and microphone jacks as well as a Power and Reset button. End customers will find the Sharkoon Nightfall U3 and the Sharkoon Rebel9 Alu U3 available for the suggested retail price of 44.90 (Rebel U3) as well as 54.90 euros (Nightfall U3) from authorized retailers.